This print commemorates a performance of Keisei Ishikawazome (けいせい石川染) at the Chikugo Theater in Osaka in 1/1848. 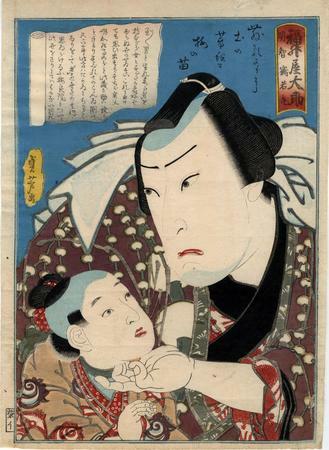 Illustrated in Ikeda Bunko, Kamigata yakusha-e shūsei (Collected Kamigata Actor Prints), vol. 3, Ikeda Bunko Library, Osaka 2001, no. 195.